Overall, Rockstar's western had very solid combat. Its cover system was nearly perfect for its time. But where it mostly lacked was in variety of encounters--shootouts became repetitive at times, often falling into the trappings of duck and cover shootouts, and the player's arsenal wasn't very sizeable either. For the most part, Marston's armaments felt like an afterthought rather than a focus, which made little sense for a genre otherwise known for its gun fights. The game didn't even add certain traditional western weapons like Tomahawks until the DLC. In addition to a larger set of weapons to choose from, the ability to craft and modify the protagonist's weapon would be a welcome feature, especially if it included modifications to iconic guns like the Winchester Repeater. It could even go further, allowing the player to custom tailor their weapons and skills to adhere to their playstyle. Choosing between a sharpshooter loadout versus a tavern brawler would add immense depth as well, ultimately giving your character added personality through their gameplay style. 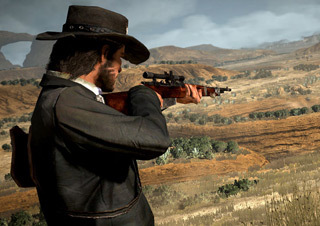 What if Marston would like to craft a special bow so he could hunt wildlife better? Or perhaps he'd like to be known for his infiltration abilities, slitting the throats of his enemies while they slept by the campfire? And maybe he'd like to be a revolver wielding gunslinger with impeccable aim but extraordinarily slow reload times? Either way, Rockstar could--and should--do more in this arena. Gamers generally hate DLC and there's a lot of merit to their disdain. But let's face it, downloadable content is inevitable in this day and age--and quite frankly, if it has to exist, there isn't a better series for it in terms of track record. 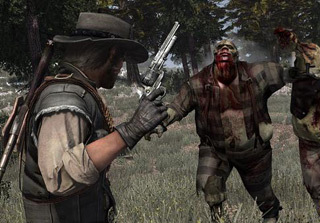 Red Dead Redemption's major DLC was the groundbreaking Undead Nightmare which provided an alternate reality filled with an apocalyptic experience so compelling it was eventually released as a standalone title. If not Undead Nightmare, then perhaps they could take cues from Grand Theft Auto IV's Ballad of Gay Tony. Branching away from Niko Bellic and his story, Rockstar was able to bring Liberty City to life with completely new characters and showcasing the seedy underbelly of its celebrity nightclub scene. Its narrative also intertwined with the other two DLCs for GTA IV, making it a downloadable experience to remember. In any case, we hope that when RDR receives DLC the developers experiment as they did before. The results were a very original genre blend of horror and western--two things that work surprisingly well. DLC doesn't always have to be just some new outfits or a new location, sometimes it can be a brand new game. And hey, as Undead Nightmare proved, it can even make zombies fun again. Grand Theft Auto V had the best online experience yet for a Rockstar game. Rockstar San Diego's job listing hinted that the company is looking for talent to create a solid multiplayer experience and we can only hope this means Red Dead Redemption is looking to upgrade its online gameplay in the next iteration. Traversing the west in a manner similar to GTA V's San Andreas multiplayer would be amazing. Imagine holding up someone else's wagon with your friend over Xbox Live then hogtying them over to the railroad tracks--all the while demanding they give you their money for a chance to be let go. Of course, in addition to improving the multiplayer, Rockstar needs to actually port Red Dead Redemption to the PC. They did it with Grand Theft Auto, after all. Not only will it make the millions of PC gamers happy, it will help expand the sales for the newest installment. In any case, all we can do is dream of the day when the next installment of Red Dead Redemption arrives. With any luck, it won't be too far out--and with even better luck, they'll be following a release schedule that involves it coming out just in time for the holidays of this year. Ashelia is the producer of LolKing. She also worked on Wowhead as its former site director. You can follow @ashelia on Twitter.